The Buxa Tiger Reserve with an area of 759 sq.kms was established in the year of 1982-83 at the north eastern corner of West Bengal bordering Bhutan and Assam. The core area of 315sq.kms around the Buxa Duar Fort was declared a National Park in January 1992. This park is located in eastern Dooars (rolling humid plains) at 2600 ft above sea level. The Dooars comprises of deciduous forests which are densely wooded and grasslands and is home to some of West Bengal's most varied flora and fauna. This tropical rain forests having an annual rainfall exceeding 5000mm has 150 species of plants and a variety of creepers, orchids, grasses, bamboo and cane. Trees like Teak, sal, simul, sishu are found in great numbers. 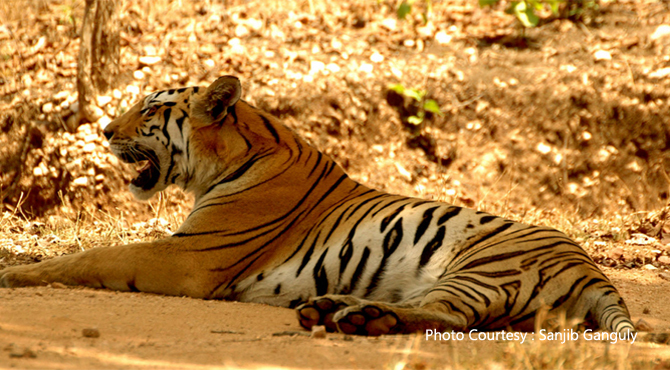 The fauna of the park comprises 67 species of mammals, including 23 endangered ones and 36 species of reptiles. Besides the Royal Bengal tiger the second largest in number in West Bengal after Sunderbans, elephants, bears, civets, giant squirrel, Gaur, Chital, clouded leopard, wild Buffaloes, antelope and snakes including the regal Python are found here. About 230 species of birds and innumerable butterflies add colour to the forest. The rivers of Raidak and Jayanti which flow through the forest and the Narathali lake are home to migratory birds as well as endemic ones which abound the place. The Hornbills including greater Pied Hornbill, Ibis Bill, Trans Himalayan Migratory Goosanders, Red-stars, Wag-tails, the rare black necked crane, migratory common teal, black stork, Large Whistling Teal, Minivets, White Eyed Poachared are some of the bird species sighted here. The headquarters Alipurduar court is a few km away from the tiger reserve. The two main entry points are Buxa (24km) and Jayanti (30 Km). Buxa (2600ft) is a two hour trek through picturesque surroundings from Santlabari, the starting point. The Buxa Duar fort here was used as a prison by the British, because of its remoteness. Many freedom fighters were imprisoned here. After independence, it served as a refugee camp for Tibetans and Bangladeshis. There is a 4km further trek to Rovers Point (the land of unknown birds at 4500ft) or a 14km trek to Roopam Valley in Bhutan from Bhutan. From Buxa, one can also take the 13km trek to Jayanti through the beautiful jungle preferably with a guide. There is a stalactite cave, popularly known as the Mahakal cave at Jayanti. Another entry point Rajabhatkhawa (17km from Alipurduar) has an orchidarium, animal rescue centre and a nature interpretation centre.